Two celebration at dates close to each other. 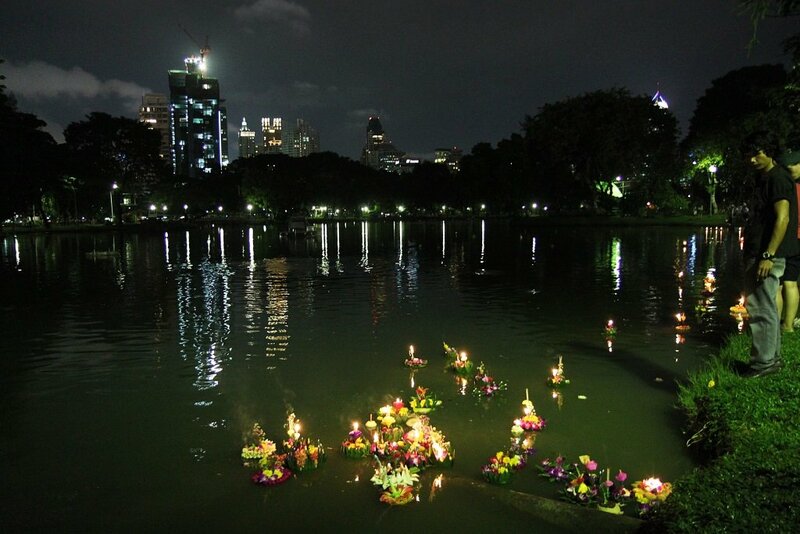 Loy Krathong and Kings day. If you can, come in this period to Thailand. You will get a unique experience! 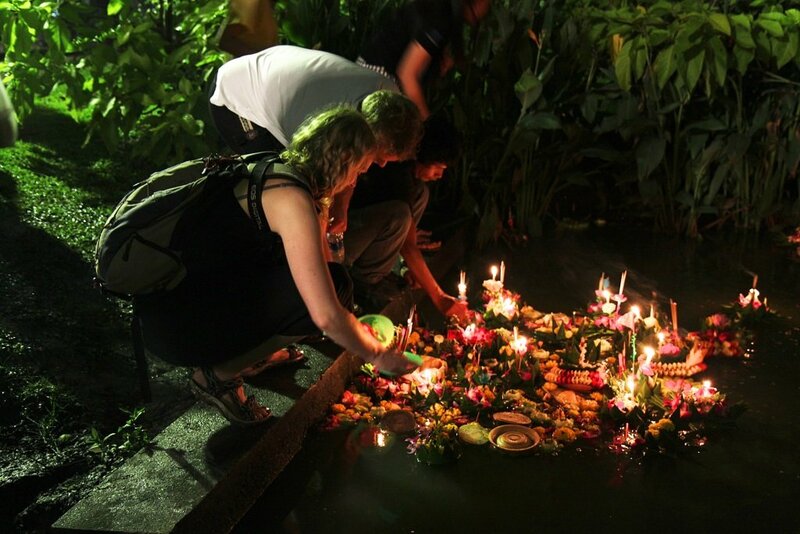 Loy krathong is a celebration in Thailand and surrounded countries. 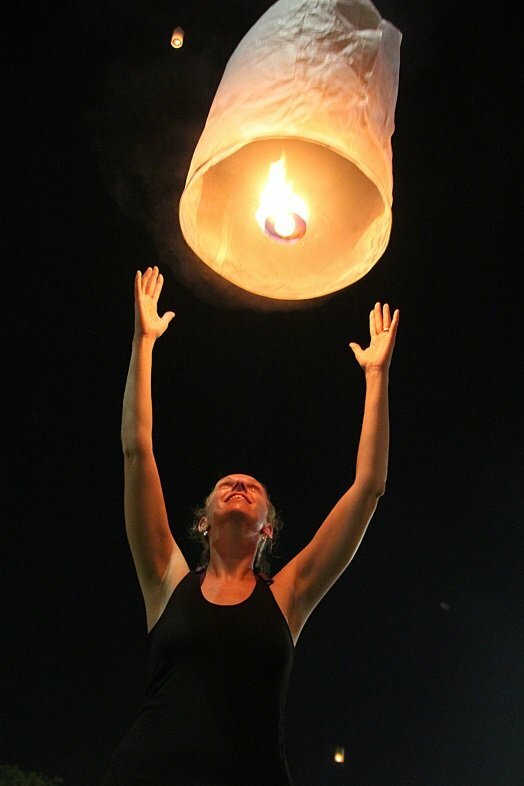 You can translate the word Loy Krathong in floating basket. 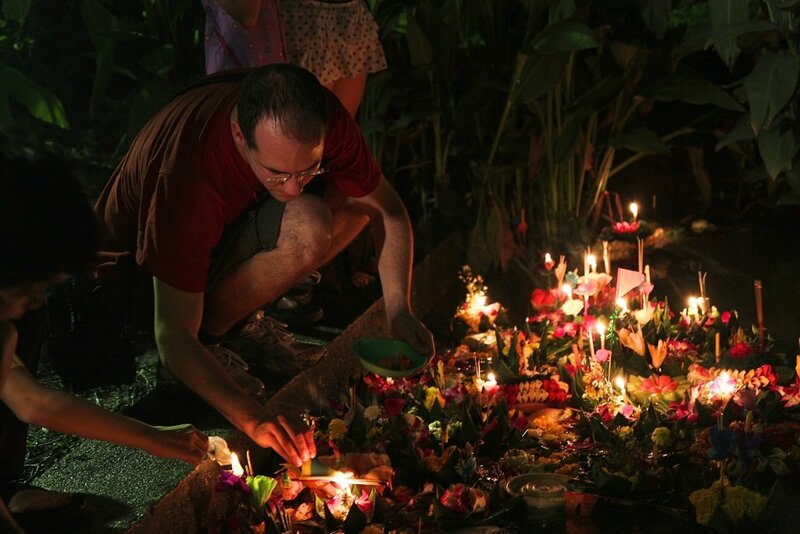 The celebration takes place on the evening of the full moon of the 12th month in the Thai lunar calendar. 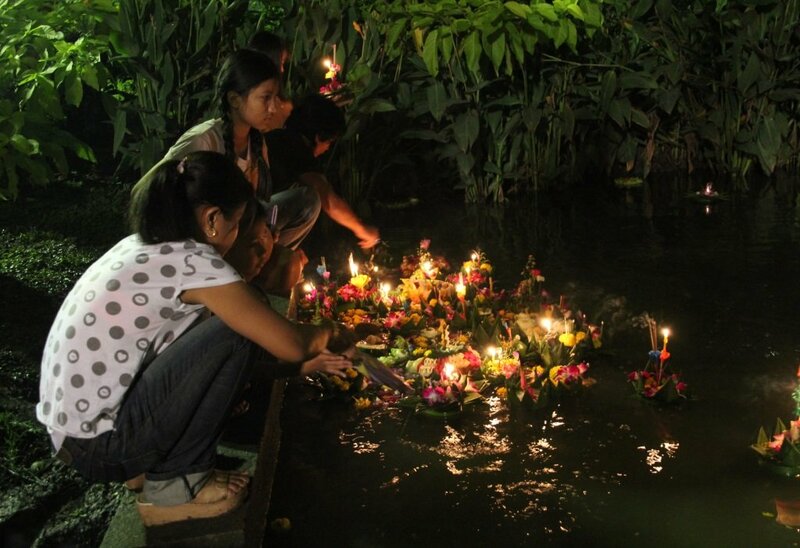 On the night of the full moon, the krathongs will be floated on a river, pond or canal. The people make a wish as they do. 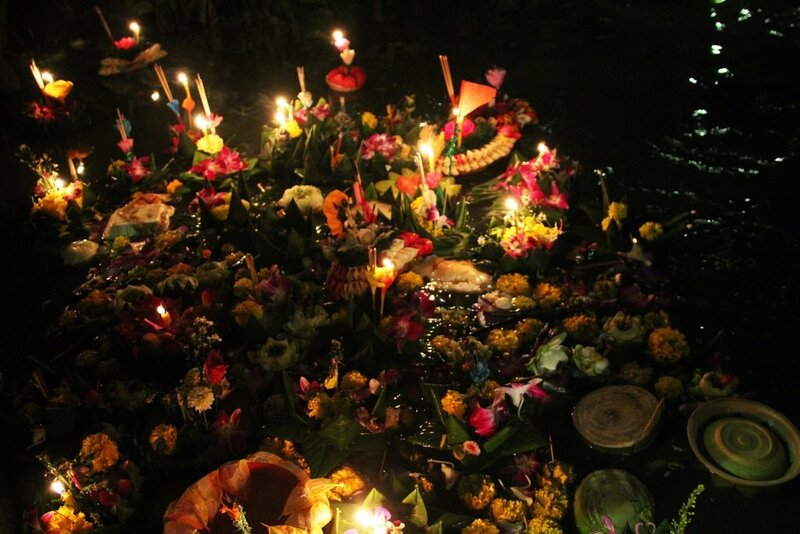 The festival is an account ritual of paying respect to the water spirits. The traditional crating is made of a piece of a banana tree. The baskets are decorated with the most beautiful flowers. 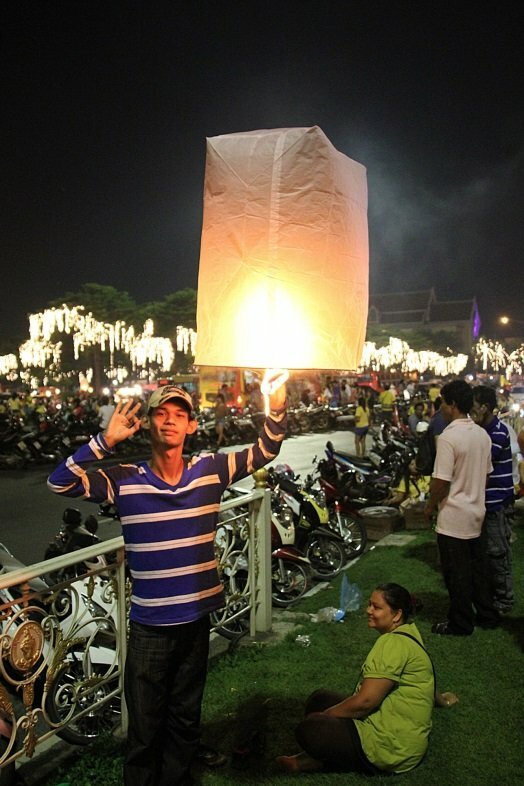 In 2012 I was in Bangkok at the time of this festival. 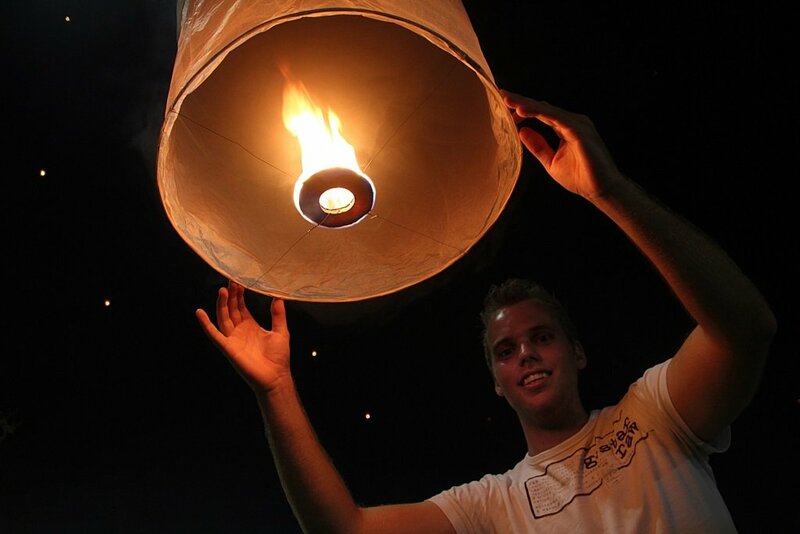 Together with my brother Anton and my friend Marijn we traveled through the city to go to the Lumpini park in Bangkok. 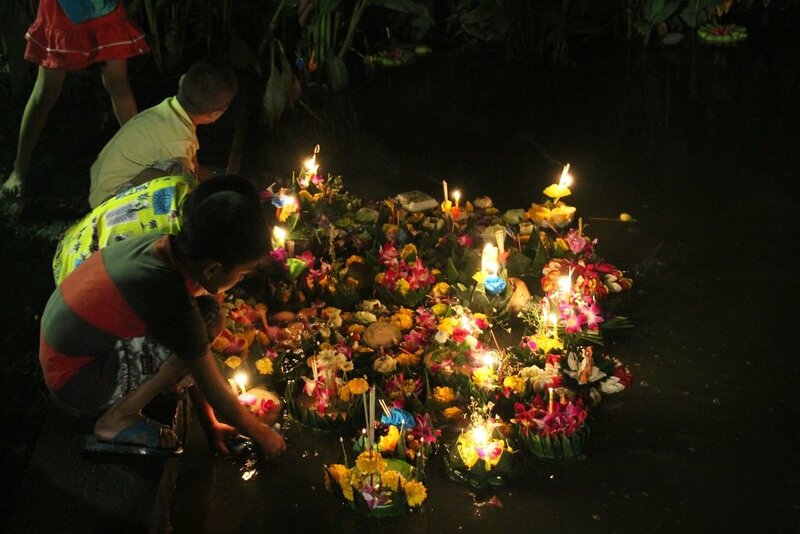 There where some people to float their krathongs. 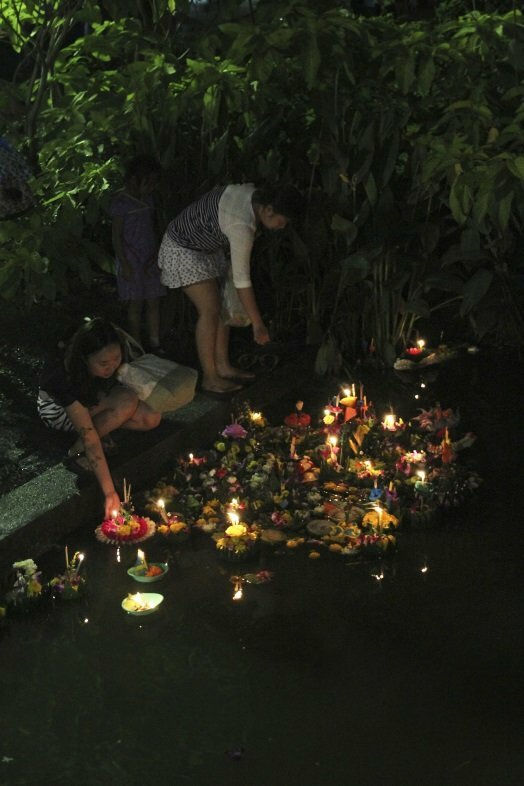 We looked around and floated a krathong ourselves. 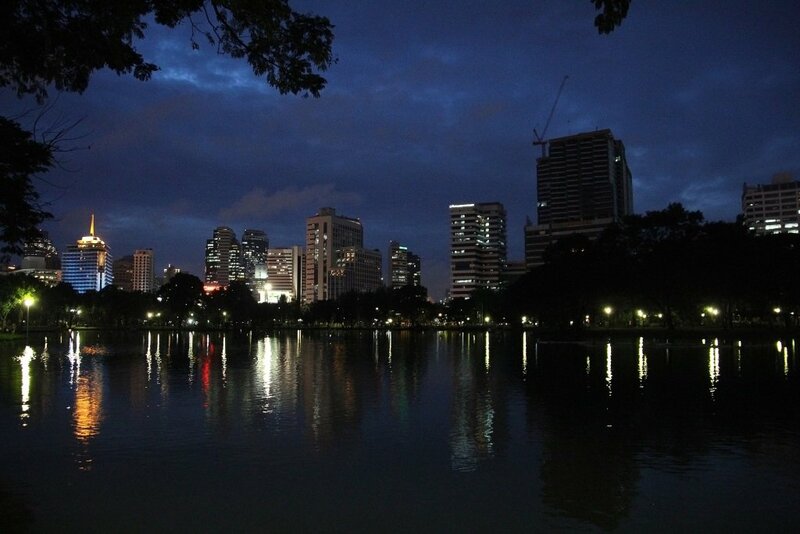 Since Anton and I needed to leave the city early next day, we left the park in the early evening. I think when you stay longer it will be more crowded. 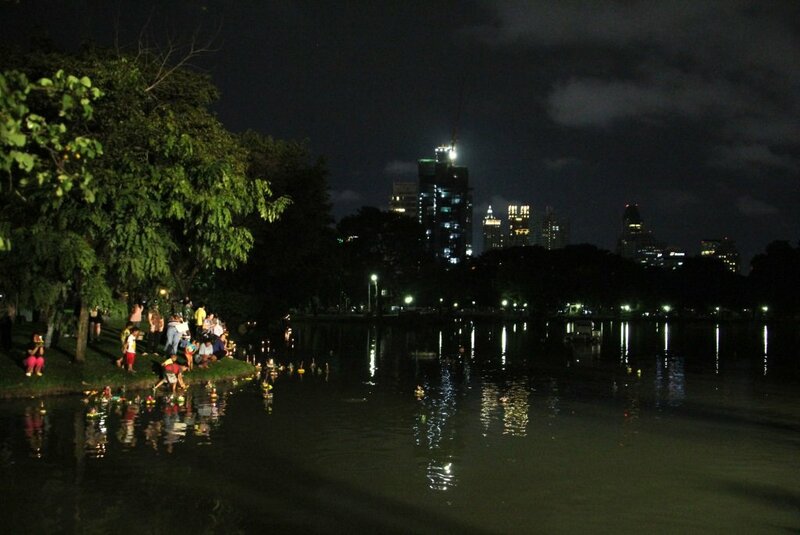 It was nice to see the children and people float their krathong with respect! 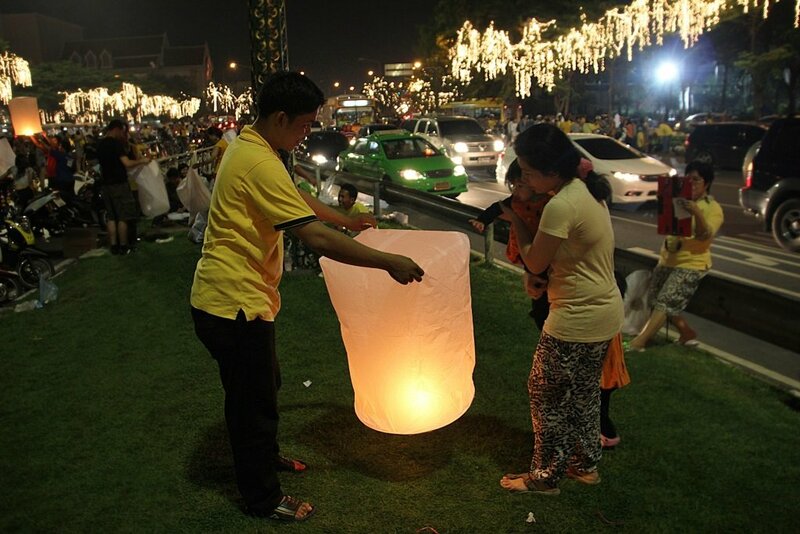 I even heard there is a contest of the most beautiful krathong. Just ask around. 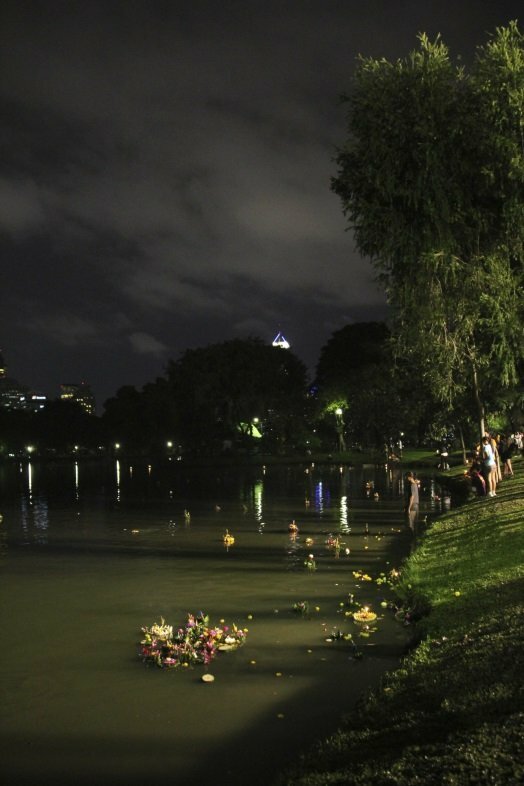 Anyway you can buy a krathong yourself. Around the ponds and canals there will be some stands setups where you can buy them for only a few Euros. Thailand is a kingdom. The king of Thailand Rama IX is born on 5th December 1927 and he is a king since 1946. The 5th of December the whole country will celebrate the birthday of the king. When I was wandering around on this day I noticed that a lot of people where wearing something yellow, mostly t-shirts. This is like a national colour for the country. You can say it is the same in my country, The Netherlands. Here we wear orange on kings day and we use this color as a national colour. When I was wandering around on this day I noticed that a lot of people where wearing something yellow, mostly t-shirts. This is like a national color for the country. You can say it is the same in my country, The Netherlands. Here we wear orange on kings' day and we use this color as a national color. This day is special to all Thai. The working days are shorter. I tried to get from the airport to the city center and I was in traffic jam for a long time! All the people are on the move and going to the places where it is celebrated the most. 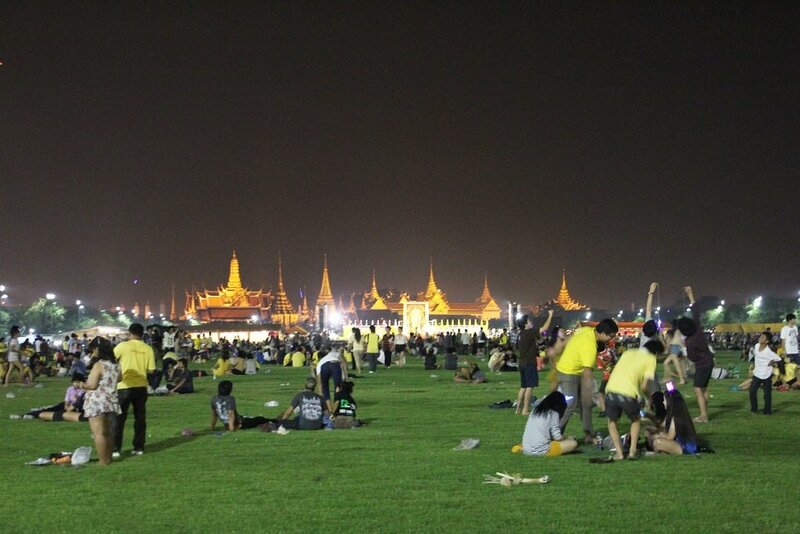 Since I stayed close to Kao san road I just walked with my brother and my friend to The royal palace. Here there gathered a lot of people. In front of the palace there is a big grass field. Many people where chatting and letting wishing balloons in the air. This is some kind of synonym too. These wishing balloons will go in the air a lot and everywhere. It was really cool to see al this lights! 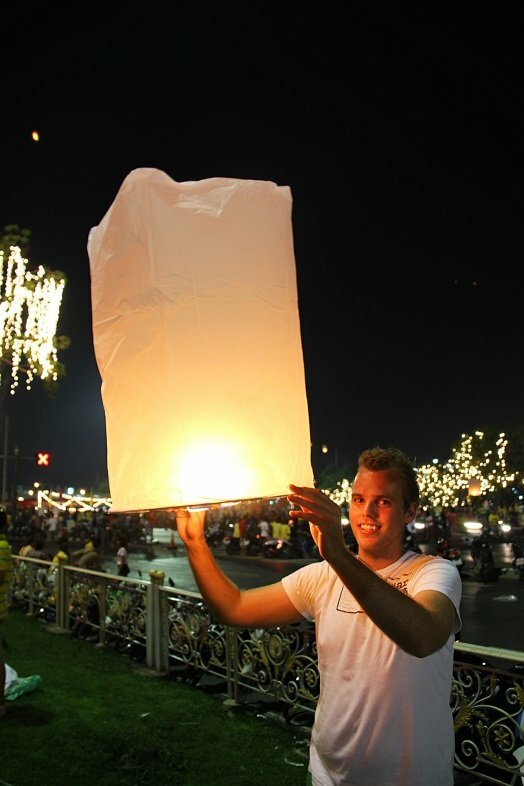 I heard that the best place to see is up north, but here in Bangkok we also could see hundreds of lights in the air! 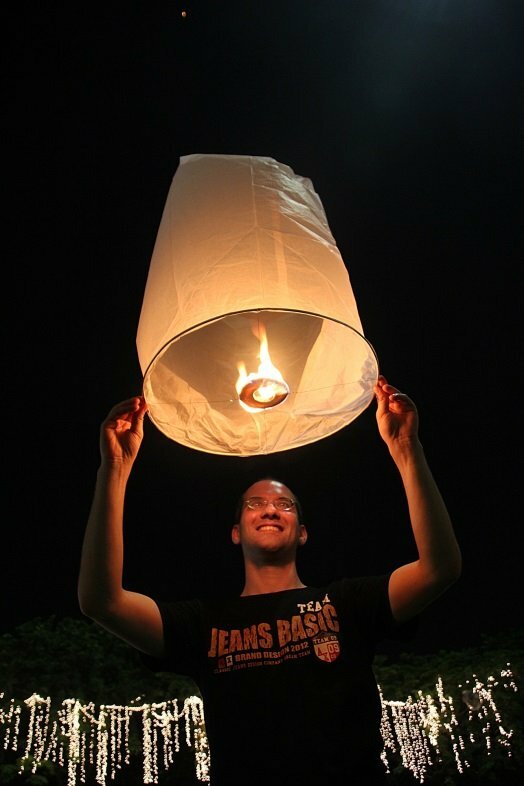 Can you imagine how it would be like in Chiang Mai? The people where really friendly. Police man wanted to chat with us and where happy we want to celebrate this day with them. Both celebrations and festivals are really a nice thing to visit. You can interfere with the locals, people are really friendly and helpful. 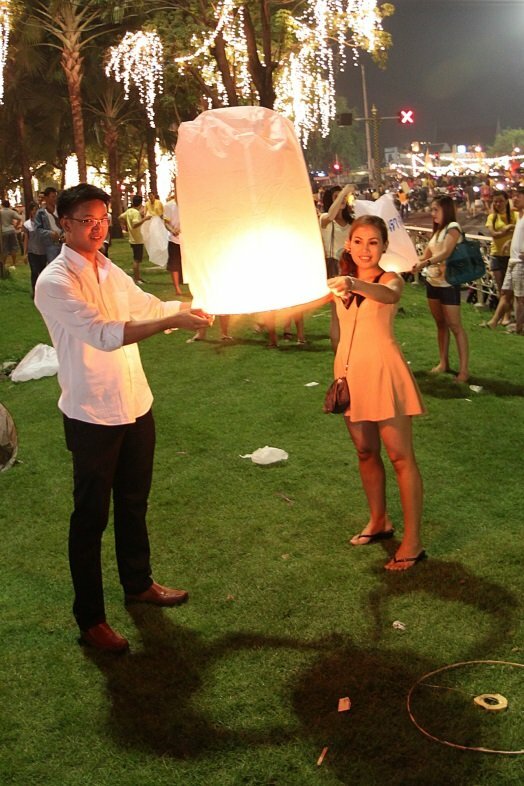 Just enjoy the krathongs and the lights of the wishing balloons. If you can, come in this period to Thailand. You will get a unique experience!